At the rear of Castle Farm you will find this sign on reaching open fields. I would like to know if it is lawful to display a sign like this. There have also been other signs telling walkers to stay to the footpaths. I will investigate. 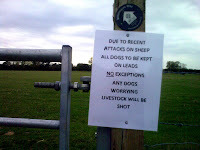 9 Killing of or injury to dogs worrying livestock. (b)that within forty-eight hours of the killing or injury notice thereof was given by the defendant to the officer in charge of a police station. (b)the circumstances are not such that liability for killing or causing injury to the livestock would be excluded by section 5(4) of this Act. (b)the dog has been worrying livestock, has not left the vicinity and is not under the control of any person and there are no practicable means of ascertaining to whom it belongs. (4)For the purposes of this section the condition stated in either of the paragraphs of the preceding subsection shall be deemed to have been satisfied if the defendant believed that it was satisfied and had reasonable ground for that belief. (b)land belongs to any person if he is the occupier thereof.